Perception debuts tonight on TNT at 10 p.m. Eastern. 2012 is proving to be a good year for both Grace Adler and Will Truman: Not only did Debra Messing manage to find her way into a series that earned itself a second season (Smash), but now Eric McCormack has found himself a role that might actually give him a much deserved opportunity to break away from being just “the guy who played Will on Will & Grace.” Not that McCormack hasn’t been trying, but his efforts to be some semblance of an action hero in A&E’s adaptation of Michael Crichton’s The Andromeda Strain didn’t succeed in earning him anything else in that realm, and his last attempt at co-fronting a series—TNT’s ad-men dramedy, Trust Me—proved a short-lived venture. It seems as though TNT still had faith in McCormack, however, since they’re the ones who are giving him another shot. Perception stars McCormack as Dr. Daniel Pierce, a college professor who, when he’s not lecturing his students about the wonders of neuroscience, is busy battling paranoid schizophrenia. As you’d expect, this makes his lectures somewhat on the eccentric side, but the man’s a genius, so the higher-ups at the school—most notably Dean Paul Haley, played by LeVar Burton—do their best to tolerate his occasionally odd behavior in order to maintain access to his formidable genius, with Pierce’s assistant, Lewicky (Arjay Smith) helping keep the professor in line as well. In the pilot, Pierce is visited by one of his former students, Kate Moretti (Rachael Leigh Cook), who’s now an FBI agent… again. See, she used to be an agent, during which time she convinced her bosses to let her use Pierce as a consultant on her cases, but when she left the department, Pierce felt it wasn’t as much fun, so he went back to teaching full-time. Turns out that Kate’s back on the attack, however, so Pierce agrees to tag along on her latest assignment. Given that Perception is a procedural, it will not shock you that you don’t technically need to know anything about this particular assignment whatsoever to make a decision about whether or not you’ll like the series, so let’s just bypass discussing it altogether, shall we? Here, however, are some points which may well prove important in helping you decide if this is the series for you. First and foremost, yes, Pierce is eccentric. He’s as grouchy as Dr. Gregory House when he doesn’t get his way or isn’t taken seriously, he’s as out of touch with popular culture as Bones’s Dr. Temperance Brennan (at one point, he even responds to a Nicole Richie reference by saying, “I don’t know who that is”), and the only possible way you can avoid comparing him to Charlie Eppes is if you’ve never seen an episode of Numb3rs. If he gets antsy and feels that reality is closing in on him, he’s prone to putting on his headphones, cranking up the classic music on his Walkman, and conducting an invisible orchestra. Oh, and did I mention that he’s prone to hallucinations? More than once in the pilot, Pierce finds himself in conversation with individuals who exist only in his mind. This proves rather awkward when he’s out in public, as one might imagine, but it also proves highly conducive to crime-solving, as his unconscious mind often works out solutions to problems through these hallucinations, creating individuals who offer helpful advice or hidden facts that no one else has seen. This results in a bit of fun for the viewer, as you’re perpetually guessing which people he’s speaking with are real and which ones are figments of his imagination. Granted, it’s a gimmick that could grow old quickly, but it plays rather cleverly in the pilot, at least, so here’s hoping the producers can keep it interesting. 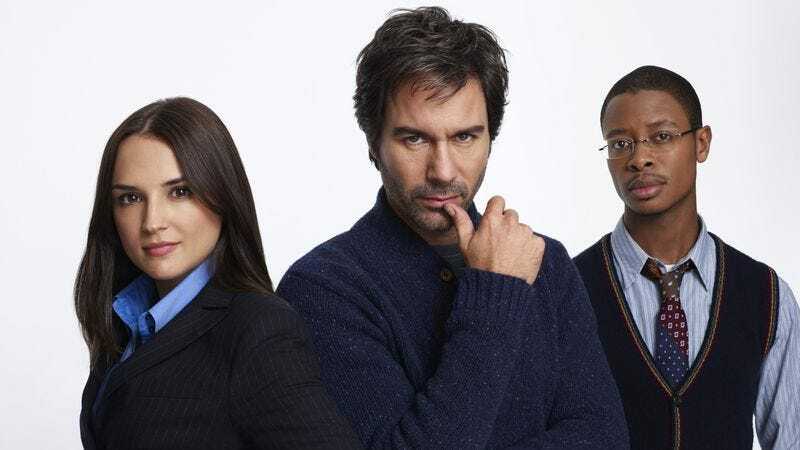 Given the buddy-comedy aspects of the McCormack/Cook pairing, Perception often feels more like it belongs on the USA Network—it has “Characters Welcome” written all over it—but McCormack brings a bit more darkness and depth to his performance than you’d generally expect from a USA series. Also, there’s clearly more to Cook’s character that we’ve yet to discover, since she indicates that her superiors had declared that she got a bit too involved in her cases in the past. Yes, the premise is a little gimmicky, but McCormack’s presence and his refusal to take his performance over the top, something which a character like Pierce lends itself to, help it rise a bit higher than it might in another actor’s hands. It’ll be interesting to see how it progresses over the course of the season.